One of the biggest booth promotions in Arinex’ history took place in June at the World Gas Congress (WGC) in Paris, France for the 18th International Conference & Exhibition on Liquefied Natural Gas (LNG 18), which is coming to Perth in April 2016. 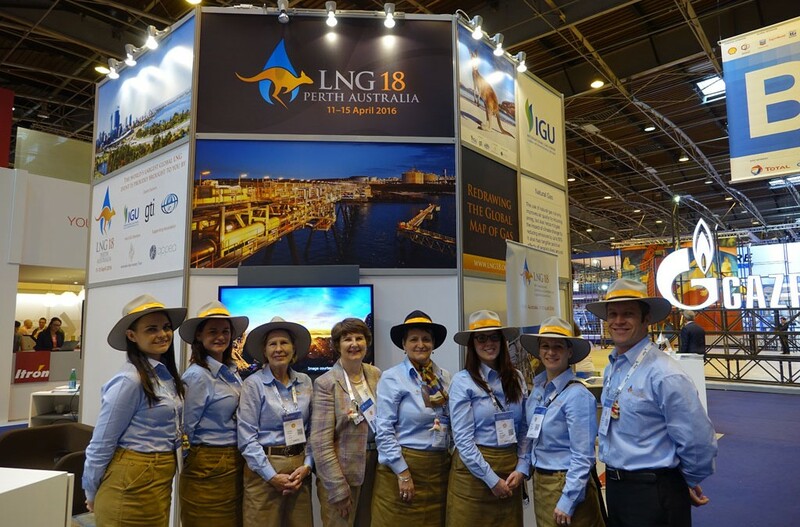 A strong contingent of eight Arinex staff, dressed in Australian-themed LNG 18 branded outfits, managed a successful promotion which aimed to raise brand awareness for LNG 18 and encourage WGC delegates to register for the conference. The team also managed a two-day meeting for the 45 strong program committee and assisted with organising an Australiana-themed cocktail function which was attended by the Australian Minister for Foreign Affairs, Julie Bishop MP. The team met with key exhibitors and engaged publishing companies to participate in LNG 18 as media partners. Rooby the kangaroo was a huge hit with all WGC participants – as were the small LNG 18-branded kangaroos. The booth was visited by over 1500 delegates and was a huge success. The team will deliver one last booth promotion for LNG 18 in October 2015 at Gastech in Singapore prior to the Conference next year in Perth.